Vitralls Bonet was created by Josep Maria Bonet in 1923. 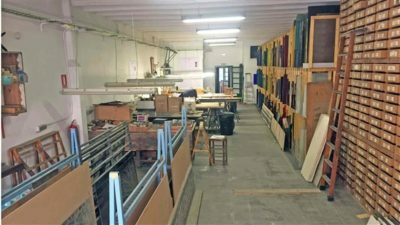 From that time, the skills and spirit of the craft that highly respects traditional techniques and methods, at the same time keeping up with constant developments and innovation in the field, have been passed on from generation to generation, from master to apprentice. 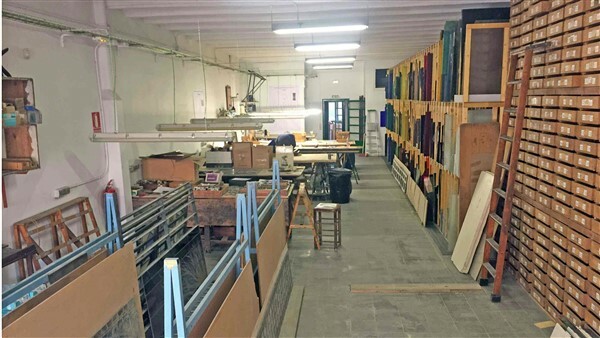 These days the workshop has adapted to the requirements of the market working with a highly skilled and specialized staff capable of facing any situation regarding the conservation, restoration or the creation of stained glass windows, etched and gilded glass. 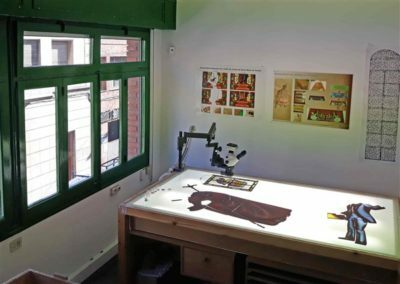 Our studio works according to the stained glass conservation guidelines established by the Corpus Vitrearum Medii Aevi in 2004. After investigating, the results are carefully analysed and most suitable plan of action established and then followed. 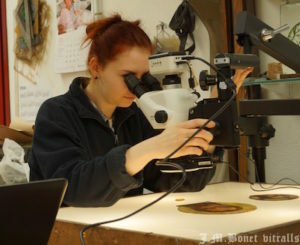 Initial state, restoration process, materials used and the final state of the object are documented and delivered to the manager of the project. 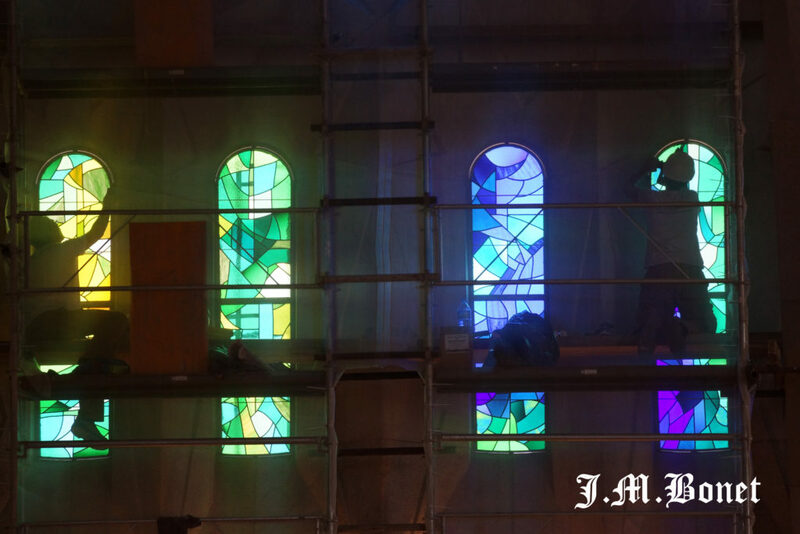 The team consists of specialists that cover various fields necessary for stained glass creation and restoration. 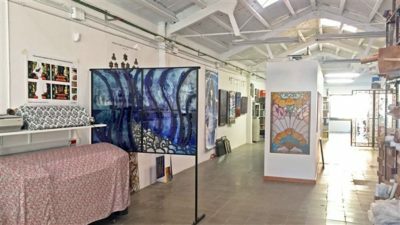 There are two creatives, with a degree in Fine Arts and mural painting, a chemistry graduate specializing in conservation and restoration of stained glass, a conservator-restorer with a MA in stained glass conservation as well as glaziers, glass etching and gilding specialists and installers. 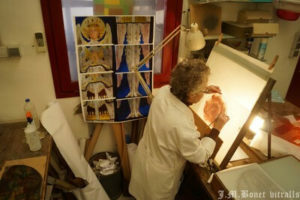 To the academic education are added training at the studio and years of working experience. 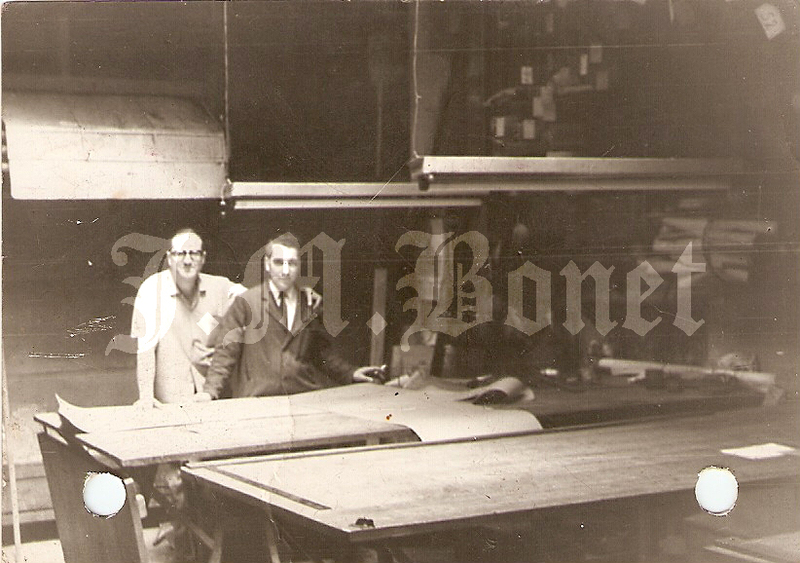 In 1923 Josep Maria Bonet (La Seu d’Urgell 1903 ̶ Barcelona 1988) founded the workshop with his brother Xavier Bonet (1897 ̶ 1985). The family has roots in the town of Arsèguel in l´Alt Urgell. As a young man he studied in Barcelona at l´Escola de la Llotja, where he specialized in drawing. There he met Montsardà, Labarta and Commeleran, artists with whom he would later work. He learned the craft of stained glass making at the Oriach workshop where was already working his older brother. 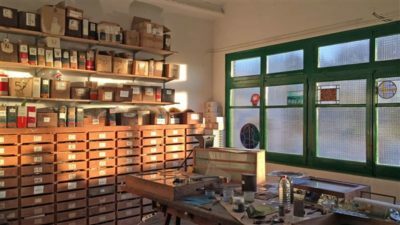 The first works were by the artist Daríus Vilàs and the architect Josep Maria Pericas in the parish of Carmen de Barcelona and in Sant Joan de Reus. 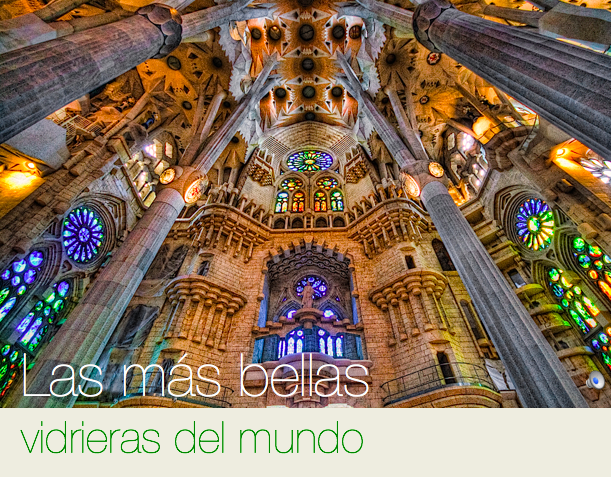 They also made the stained glass windows for the crypt of Sagrada Família in Barcelona in 1930. 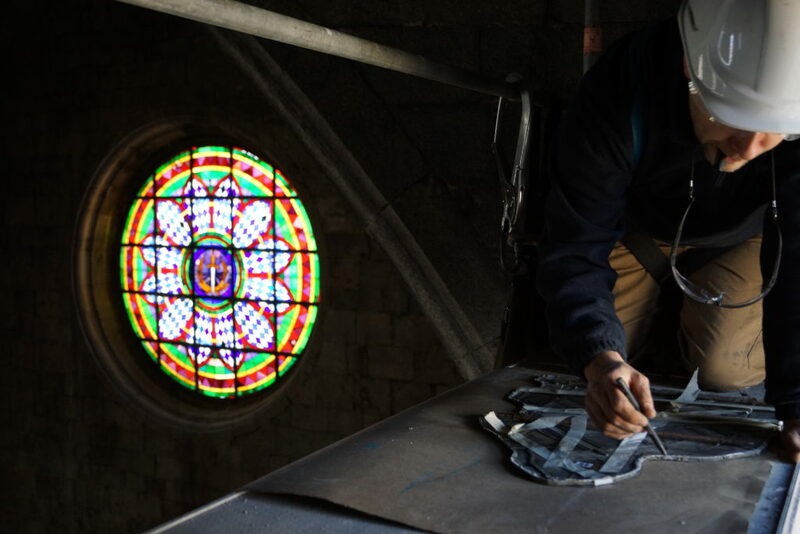 The workshop worked on the production of stained glass windows, in its restoration as well as etched glass. During the civil war it was collectivized, while both J.M. Bonet and Xavier Bonet took up other professional activities. 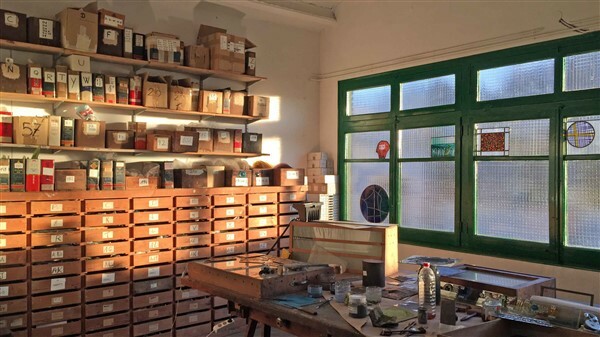 Next to realizing a great work on Catalan stained glass, workshop also focused on improving materials and work processes e.g. 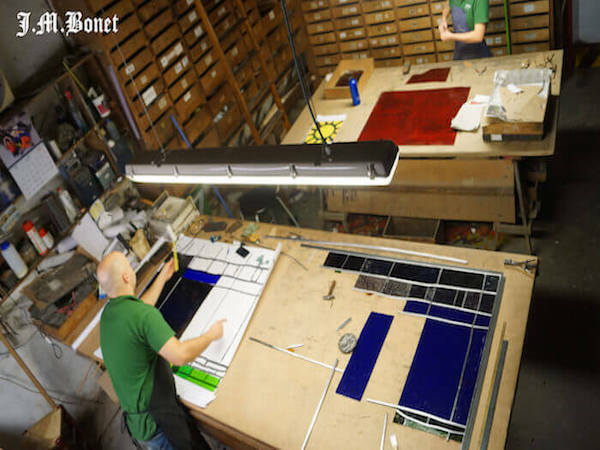 Tiffany-style lamps were introduced to Catalonia and in the process of glass etching, the former laborious use of tin foil and Brunswick Black was replaced by adhesive vinyl sheets. Transept of the church of Llars Mundet with Will Faber. Chapel of the Hospital of Granollers with Ramón Rogent. 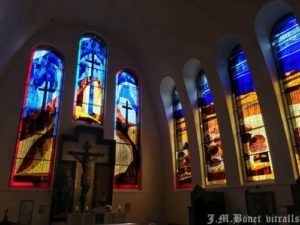 Stained glass windows for the Cathedral of Girona in parish of Rubí with Domènech Fita. Carmelites de Vic with Carles Madiroles. 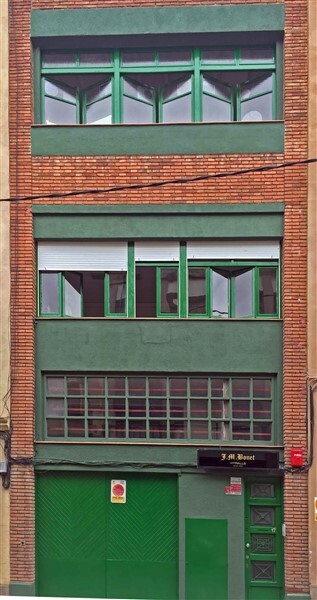 Josep Maria Bonet received the diploma of artisan master glazier in 1986. He died in Barcelona in 1988, working at the studio almost until his last day.